Peacefully, surrounded by loving family, at the QEH, on Friday, August 10, 2018, Lillian Irene Rayner (nee Bernard), in her 100th year, went to be with her Lord. Beloved wife of the late George M. Rayner. Born at Skinners Pond, P.E.I. on April 24, 1919, she was the daughter of the late Thomas and Margaret (nee Handrahan) Bernard. Mother to Lois Carew, Willard, Archie (Bev), Shirley McCue (Wilfred), Pansy Webster, Norma Cairns (Wyman), Everett (Bernie), Sandra Davis (Jim), Tommy (Debbie), Glenn (Maureen), Bea Roberts (David), and Erma McInnis. Predeceased by John Carew, Faye Rayner, Albert Webster, David McInnis. 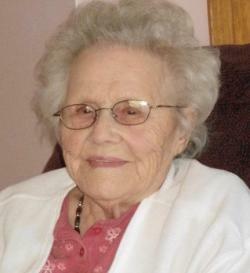 She was grandmother, great-grandmother and great-great-grandmother to over 250, and aunt to many nieces and nephews. A Celebration of Life will be held at Sherwood Church of Christ, 9 Lilac Ave., Charlottetown, on Sunday, August 12th from 2:30-4:00 p.m. Resting at the Rooney Funeral Home, Alberton. Visiting hours Monday, August 13th from 4:00-8:00 p.m. Funeral Tuesday afternoon from the E. Gerald Rooney Memorial Chapel at 1:00 p.m. Interment in the Greenmount Church of Christ Cemetery. As an expression of sympathy,memorials to the Greenmount Church of Christ Cemetery Fund or to the Maritime Christian College would be gratefully appreciated.